This is the third pattern in the Lacy Lady Collection. 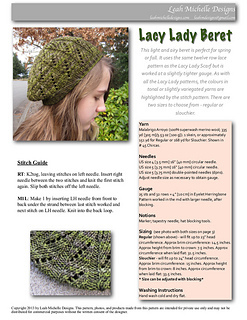 Other patterns include the Lacy Lady Scarf and Lacy Lady Shawlette. Each pattern may be purchased separately or all three may be purchased as an ebook set. There are two sizes to choose from - regular (fits up to 23” head circumference) or slouchier (fits up to 24” head circumference). In the photos shown here, the green beret is the regular size and the brown beret is the slouchier size. Blocking is necessary to open the lace pattern and to establish the shape and size of the beret. Go to leahmichelledesigns.com for a beret blocking tutorial. Yarn: 151 yd (138 m) / 45 grams (1.6 oz) of sport weight wool or wool blend yarn that can be blocked for the regular size. 168 yd (154 m) / 50 grams (1.8 oz) of sport weight wool or wool blend yarn that can be blocked for the slouchier size. Skills required: knitting in the round, increasing, knitting lace (k, p, k2tog, yo, RT), blocking a beret. Pattern includes both charted and written instructions for the lace stitch, abbreviations, notes, and stitch guide. A photo tutorial showing how to work the right twist stitch can be found online at leahmichelledesigns.com.